Self Storage Swindon options. 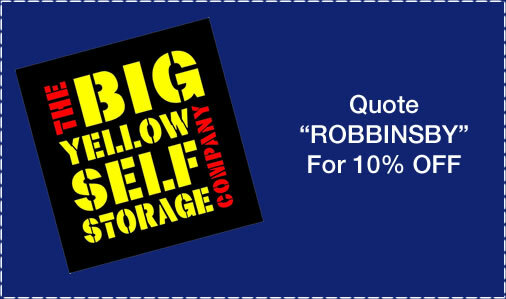 We currently work closely with Big Yellow Self Storage and have done so now for the past 7+ years. Our experience with them has been great and they certainly deliver in all aspects of superb customer service and fantastic facilities. Here are a few words from the team there……. So why should you use Big Yellow? We’ve teamed up with Robbins Removals to provide the complete moving solution. Jon and his team share our commitment to a high quality and a hassle-free service. This shared vision is why we are happy to offer all Robbins Removals customers an ongoing 10% discount on their storage costs. You care about your possessions and so do we. You can relax, safe in the knowledge that your goods are being stored in an individually alarmed room, monitored 24/7 by CCTV. Through our extensive customer feedback program, we will continue to change the way we work to give you what you want. Our innovations in the industry have all been developed with the goal of providing the ultimate customer experience. We have a fantastic range of packing materials both online and in store that can be delivered direct to your door. Our boxes are excellent quality, durable and strong to keep your items safe on their journey to the store. You can also get up to 25% discount on boxes by enquiring with us online. A massive car park and huge loading bay provide easy access to the storage area and capacity for all sizes of van or lorry, trolleys are free to use to move your items from your vehicle and our high capacity lifts can take you and your goods smoothly up to your room. We are a great moving company!